You have made it to family hour and we are the Morton Family. Let me introduce our crew. I am Gina, this is my husband, Dennis, our son, Charlie who is 6 years old (give a wave) and our little girl, Simone who is 2 years old (do your Diamonds up!) We also have another little one that will be here at the end of the summer. Each year during family hour we get to hear the incredible journeys of families that have beaten cancer, some still going through it and unfortunately from one or two that have lost a child to cancer. We lost our child to cancer but our story is not one of death, it is of life. It is of a life that was but a blink of an eye. It is the story of our son, Theodore Paul Morton. Big name for a little guy but you can call him, Teddy. Teddy lived 127 days. Every mom has her birth story. So here is a quick rundown of mine. It was a cold night on December 15th, 2008. I checked into Lehigh Valley Hospital at 10:14pm. Teddy’s official time of birth was 10:21pm. Seven minutes for you math majors. I liked this kid immediately, he was efficient. He was beautiful and looked very much like his big brother, Charlie. The only thing alarming was that he was covered head to toe with fingerprint sized black and blue marks. I had read all the baby books, twice at that point! And they NEVER said anything about polka-dotted babies. A few hours later Dennis and I were asked to go upstairs to the NICU (neonatal intensive care unit) where a large semi-circle of medical professionals had gathered before us. One doctor began to speak and he said, “your baby has an unusually high white blood cell count. In fact, it is higher than any of us has ever seen. His little body is definitely fighting something, we just don’t know what.” I was the next to speak and I asked, “isn’t that a sign of cancer?” They were all staring at us and they were all silent. And I knew. Dennis: Up until 2008 we were told there had been 150 documented cases of congenital leukemia or babies born with cancer in the world. Of those 150 cases, 30 had what Teddy had. He was diagnosed with Acute Myeloid Leukemia or AML. Of the 30 babies born with AML, 15 had lived and 15 had died. Teddy would tip the scales one way or the other. Teddy was not expected to live through his first night but he did! If he was to have any chance to survive, he would need to be transferred to a Children’s Hospital. Gina grew up outside Philadelphia and the Lehigh Valley is only an hour from Philadelphia so we assumed we would be sent to the Children’s Hospital of Philadelphia. However, our insurance company was sending us to a little town called Hershey. 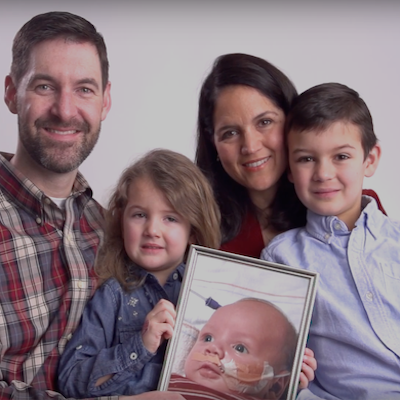 When you have a child born with leukemia, your very first thought is, “do whatever it takes to save them.” Your second thought, which comes very quickly thereafter is, “how in the world will we pay for this?” So, if our insurance was sending us to Hershey, we were not going to argue. That was our first blessing on the road to fighting cancer. Gina: Blessed is a word that we use to describe our family all the time. Some people may hear our story and feel sorry for us but, please don’t. We feel we are the most blessed family we know. We were entrusted to the task of raising Teddy and each of our children for as long as permitted. Just because Teddy’s life was shorter than what we would have chosen, it was the perfect length. He was a cute little guy born at Christmastime with cancer and named Teddy. People who never met him fell in love with him. People from all over wrote to us to tell us of their prayers for our son. Some people that hadn’t prayed in years, prayed for Teddy. Our friends rallied behind us and raised over $5,000 for the Four Diamonds Fund. And in February of 2009 we sat in a hospital room while your school danced. We cheered you on from afar and prayed for our own miracle. We felt like we were part of something much bigger than ourselves. Still, we feel we are part of something special. THON is a unique experience that I wish everyone could witness. It’s a place where we can freely talk about our little guy. It’s a place where his life is celebrated like it is in our house. Teddy probably had over 100 medical caregivers but of our family and friends he only met 31. 127 days of life and 31 people. He never spoke a word, could barely smile and slept most of the day. And yet, here we are four years later talking to over 20,000 of you about him. One little, short life has touched so many and we hope will continue to do so. Dennis: If we could say anything to you today, it would be first, thank you. Secondly, we would say we are in awe of what you have done for our family and so many others. Chris Millard was just one boy whose life was cut short by cancer yet, because of him, the story of the four diamonds has exploded into this! Each one of you has played your part. It may be public and well-known or it could be behind the scenes but you’ve all done your share. Each one of you was necessary to pull this off. In a short time we will see the final numbers of what you have done. We will see the result of you standing in the cold and rain with your cans, we will see the result of your high schools and elementary schools hosting mini THONS. We will see the results of thousands of alumni still giving, we will see the results of blisters and aching muscles. And if you could drive down to Hershey you would see the gorgeous new Children’s hospital you helped build. You would see children with cancer and many other illnesses and ailments getting the best care in a state of the art environment. You would see families eating together in the cafeteria, spending time with their sick child, filling their cars with gas and most importantly, not worrying about how to pay for it all. Today we are blessed to speak on behalf of someone who never uttered a word, you dance for someone who never took a step and a little boy who never met more than 31 people, now gets remembered and carried by thousands of you. It is our dream that one day you won’t hear a Morton family story at THON. You will only hear survivor story after survivor story and THAT will be the weekend we will dance in celebration!